Front and center, a wise old stork holds a map, allowing a lovely angel to review the recommended route. She points to a distant place, recognizing the direction she should take based on the map she’s is reading and with input from Mr. Stork. Another little cutie, tucked in a basket full of clouds, reaches with a chubby arm and points toward something that has caught his attention. Both angels’ eyes are filled with expectation and confidence; knowing their course may be scary at times, but they will be protected and guided. Few things bristle our tiny neck hairs like the idea of change in our lives. The butterflies are set free in our tummy; we may feel brave for a moment and then run-like-the-wind the next. A wise friend encouraged me to ponder the question of whether we are a part of the evolution or merely victims of change. My immediate answer was a trite, “both.” Yet, the more I thought about it, the more correct that answer felt. Still, as much as the idea may make us groan: All of life is a matter of choice and consequence. At the very least, we always have the choice of how we respond to any given situation. Are we the proverbial bending willow or the unbending branch that snaps and breaks? What makes someone a willow and are they a willow every time or are there times when they are the snap-crack heard ‘round the world? This card prompts us to look at our lives and the changes in direction that have already happened and to try to see the path before us with newborn eyes – the artist’s way of gently encouraging us to shed our preconceived notions about what our life would look like and enter each period of change as though we were a child, seeing our life going forward with fresh eyes. The privately owned park was already 60 years old by the time I could walk and yearly visits were a must-do for school picnics. I spent many a high school evening walking hand-in-hand with a boyfriend through the sparkling park, watching fireworks and sharing french fries from a paper cone. While meditating on my friend’s question of Participant vs. Victim in the dance of change, it was surprisingly an incident on the Log Racer ride that came to mind as a pretty perfect analogy. 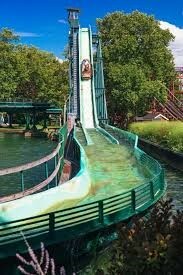 The Log Racer was a roller coaster but with water rather than metal tracks. One climbed into deep seats cut into a giant, artificial log, buckled up and whoosh! off you would go traveling up and down and around at a dizzying speed through a trough of water. The ride ended (as life so often does) with a huge, messy, often-soaking splash into a man-made lagoon. Those logs were filled with Willows and Non-Willows, and their reactions followed suit. The former sat stone-faced and listened to the engineer’s instructions for exiting safely. This wasn’t easy to do over the screams of the Non-Willows. I watched the exodus as riders stepped into nearly knee-deep water and then precariously down a now slippery and wet side track to the platform. The Willows. Some Willows stepped out, walked the narrow track and arrived on the platform a whiter shade of pale. Some arrived on the platform and then began to cry. Willows were the first ones to arrive safely. The Not-So Willowy. Some cried, wiped their eyes, took deep breaths and gingerly made their way down the track. Some just simply couldn’t stop crying and slipped and nearly fell trying to descend. Then there was the poor soul who just sat screaming and clutching her part of the log and had to be half-carried down the rail – a process that turned what was a three minute ordeal for others into a 20 minute adventure. Were they part of the experience or victims of it? Both. Part of it because they chose to board the ride. Part because what they had expected to happen, based on logic and history and careful planning, didn’t. Sometimes you’re the Willow sometimes you’re not. Not every change impacts each of us in the same way; nor do we each react the same to every change. What may cause you a meltdown today may not trigger that same response down the road. The lesson is that at some points in our lives we are better Willows. Knowing that and understanding it’s part of being human helps us to feel compassion, certainly empathy, and to better understand another’s behavior at any given time. Most importantly, knowing this encourages us not to judge and not to draw conclusions about the courage or strength of another. It takes longer if you scream and cry. Not that there isn’t a place for it but try to hold on until you hit the platform of safety. Clutching on to your log seat will only keep you in a perilous situation that much longer. It will cloud your senses and make the transition more difficult for you are likely to miss signs and steps along the way. Screaming begets back tracking. The very last thing we want! Safe at the french fry stand, you can scream bloody murder. There’s always time for screaming, but experience has taught that eh you probably won’t feel much like it after the initial, transitional steps. Watch how the others walk the slippery rail. As you begin to experience, or choose, change in your life look to see how others navigated it. What traits did they employ? What life tools were useful to them? Delayed reaction. As time passes, you may hear the odd sound of your Willow branch creaking a bit. How can that BE? It can’t be said enough that we all react to change in a different way. You may face serious trials with grace and meltdown when you can’t find your car keys. The important message, here, is to be kind to yourself during periods of change – even changes of your own choosing. Know that there are times when sitting down for that cry is just what you need to be able to take the next steps. Niccolo Machiavelli. One could argue that Machiavelli’s The Prince is a bit of a user’s manual for change in one’s life. In speaking to the pitfalls while navigating change, he offers: The dirty little secret – the fact often denied – is that unlike the mythical epiphany, real creation is sloppy. Discovery is messy; exploration is dangerous. No one knows what he’s going to get when he is being creative. So is change really worth it? Is the “devil that you know” really better than “the devil that you don’t?” I would have to think on that one for a minute, but off the top of my head, I would say it would eventually get pretty cold and unpleasant in that log. Alone. 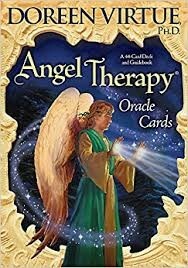 When the Change in Direction angel card is drawn as a part of your reading know that you aren’t only advised that change is coming but encouraged to allow yourself to be creative about the changes needed in your life and creative about the way you approach and navigate the changes thrust upon you. Look at each change, regardless of how it originates, as an opportunity to learn about yourself; to create a new course and – even with knocking knees – to do your very best to look at your new path with the eyes of a child. Eyes filled with wonder and expectation and trust that the angels are always with you, holding the map, in case you need to check back and see the best way through the detour. Go forward with eyes seeing all possibilities and a courageous heart knowing all will be well. Hang in there; be brave … and when you’ve arrived safely on the platform, order the french fries! 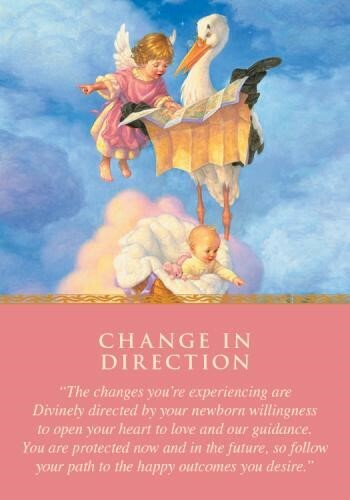 The Change in Direction Angel Card is selected from Doreen Virtue’s Angel Therapy deck.